FRC team MOE365 was recently selected as one of Next Generation of Delaware Community Foundation 2015 grant recipients. The $6600 award will support the team’s outreach programs by providing funds to build a demonstration robot and five smaller Tetrix robots to allow visitors the opportunity to drive a robot. MOE student officers, Mahesh, Sam, and Liz were invited to meet with DCF members to accept the check. 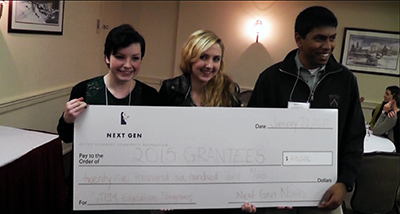 Thanks to Next Generation for their generous support! For more information on Next Generation, click here. For more on Team MOE, including info on their robot display at Delaware Museum of Natural History, click here. This entry was posted in News and events and tagged funding, MOE365, Next Generation, outreach, STEM, youth by fsreditor. Bookmark the permalink.